Gralyn - repaint it, make it more Anglican and it would be perfect. I would have thought if it was going to be more Anglican '39' would have been a better running number. One thing I always have to remember about converting stuff to look Irish is that I always have to remember it is Ireland. Things look British, but are subtly different, especially in later GSR and CIE days, and the narrow gauge tramways often had a slightly colonial look. With the NQ stock the question I am having to ask is what would Bredin or Bulleid have done to rebuild a 3' gauge carriage? It also means tackling those blasted greens - the 1945 dark green; the 1956 medium green, and the "Nile Water" (Eau de Nil) used for lettering and lining. The earlier dark green seems to have been some sort of Brunswick Green - the old Humbrol 3 was pretty close, which was uniform when it came out of the paint shop, but after that the weather worked it into the infamous forty shades! The medium green looks a lot like the Isle of Man loco green of my childhood which was a little darker/cooler than the LNER apple green, but other than 'eye-balling it' I have no scientific way of dealing with it. They may end up 1960s "Black and Tan" out of spite! Progress of a sort - at the wife's instigation we bought a wet-dry shop vac to speed up the process of mopping out the basement. I don't get much water in there - usually about 10 gallons spread over 500 square ft., but it is miserable to try and mop it up. The shop vac seems to seems to have halved the amount of time it takes, and get far more of the wet stuff up than the old mop and bucket method. FWIW, one of the surviving Cavan and Leitrim carriages was rebuilt in 1959 to go to the West Clare. The fourteen windows were reduced to something like seven, and the clerestory was boarded and felted over. It ran in that form for a year before the WCR closed. I didn't think it was THAT obscure! The Wikipedia article is a bit skewed, by the way, as the author tended to avoid Evangelical commentaries on the Articles. Anyway... the first Newqida got a coat of dark green this evening which means that Eau d'Nil is now inevitable. I decided that the 1945-1955 livery gave me a bit more wiggle room when it comes to the mythical history of the Skebawn and Castleknox, though I will follow the top stripe only style favoured on the Cavan and Leitrim. I suppose I had better start looking for someone to make some Eau d'Nil class numbers and door numbers. Narrow Gauge was a bit hit and miss on the old Flying Snail! I am now trying to think of some other ways to 'Irish them' as at the moment they just look vaguely less German. Next job is to reset the Norwegian couplers at 33mm. The second NQ started loosing its German lettering and data plates this evening, but will not be dismantled until the first one is reassembled. Norwegian chopper couplers are inevitable, but as this one is due to go to the 32mm gauge side of things they will be set at 24mm. Narrow Gauge was a bit hit and miss on the old Flying Snail! For reasons I can't put my finger on I've always really like the Flying Snail logo. 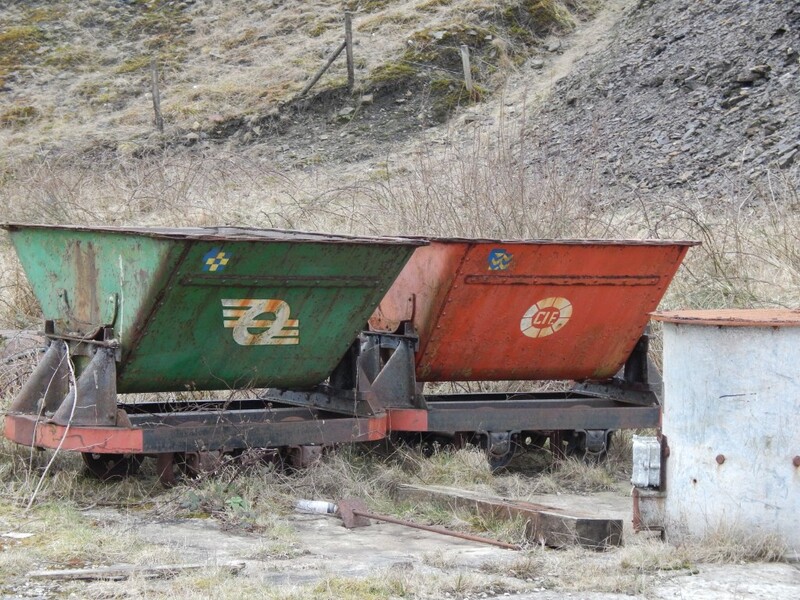 Not much call for it on my Welsh Highland carriages, but maybe I could apply it to a spare Big Big Train tipper?! One oddity of the CIE was that whilst they seemed to stick the Flying Snail on just about everything, even narrow gauge carriages! It was something of a design classic, unlike the Broken Wheel which succeeded it. Thankfully, they were a lot more sparing with the Broken Wheel. I only remember it on locomotives and some wagons, never on a railway passenger vehicle, though it appeared with some frequency on buses. Irish Rail's logos - except for the original "Set of Points" (1988-92 vintage) - have all been a bit laughable. The language police got rid of the original brand - which was based on the English name, though if someone had been quick they could of argued that the set of points stood for Iarnrod not Irish Rail . The stylized IE of the nineties and noughties was usually referred to as 'the Plug' whilst the latest logo looks like something for a cell phone app, but I have not heard what the gricers are calling that one! The various liveries had nicknames too - the forty shades of green being a humorous reference to the 1940s and 1950s CIE liveries as they aged, younger modellers call the 1960s black and orange/golden brown livery 'black'n'tan' thanks to a much repeated anecdote, and the original IE livery is referred to as tippex thanks to the white stripes applied to the old Supertrain livery. Surprisingly, the variant of the orange and black livery that adorned the Mk 2ds and the Mk3s usually got its proper name 'Supertrain.' God alone knows how that happened! The old GSR Dark Grey livery now seems to get called 'Sheep Dip' as it looked as though the loco had been dipped like a sheep, and then had its buffers picked out in red! English Enthusiasts always look a bit confused when you used to describe something as being "tippex with the plug logo." Much of my gricing in Ireland was done on Baby GM hauled trains of tippexed Cravens and Mk.2s, including a real hellfire run behind a late departing pair of Babies on the Friday night train to Ballina. The scenario was 10 Cravens, 700+ passengers, and the on time 90mph Mk 3 set right behind! P.s. Spite prevailed. I will see if I can get a photo tomorrow. Slightly highjacking - is it possible to fit chopper couplings to the Newqida coaches? Two possible methods. If you can go with a low buffer/coupler height it is possible to bolt the buffer straight to the arm that held the original LGB coupling. Otherwise one needs to alter the end of the vehicle to create a solid buffer beam so you can attach the whole coupler complete with its box. Now I will go away and see if I can think of a third. I think the Black and Orange livery suits them quite well. I chickened out on trying to paint the window frames black - at least for now. CIE rarely (if ever) left metal window frames bare metal. A little bit of attention with an old knife blade is needed to remove slight over spray, then I can add some small white numbers at either end of the golden brown band. The golden colour is a bit bright, but will tone down when I eventually weather the underframe and lower panels. Next question is - do I reinstate the mould plastic interior, or fit it with longitudinal seating as with the change of scale from 1:22.5 to 1:20.3 the length of each seating bay is reduced from about 4'9" to about 4'4", which is getting into the same knee-knocking realm as "Festobahn" 21 and 22! If I don't use the plastic interior for the two black and orange NQs they can be recycled into the wooden bodied 'heritage stock' for the outdoor line, so nothing wasted! I am now trying to decide if I do the other CIE conversion, or the first of the 2'6" gauge carriages. Peter, TBH I couldn't imagine the newqida's in black & orange, but I have to say that's really impressive. Well done. It certainly suits them and you've done an excellent job.